With all the recent buzz about what GM told dealers at the national meeting in Las Vegas, we knew it wouldn’t take long before we saw something interesting from our spies. We’ve gotten our best looks to date at GMC’s 2014 Sierra 1500 and the Sierra 3500 HD dualie prototypes. Our spy shooters say the prototypes caught here look complete with the final production-spec headlights and taillights, as well as the front and rear bumpers. It’s possible both these might be Denali models, but there is no mistaking the similarities between the grille shapes and logo masking. It’s easy to see the Sierra’s final headlight designs as it show nicely through the camouflaged front clip, revealing a chrome-rimmed, blocky shape, with minimal jewelry inside the headlight elements. At least on these test models, it appears that GMC designers have avoided the popular LED craze found on an increasing number of 2013 model headlight designs. 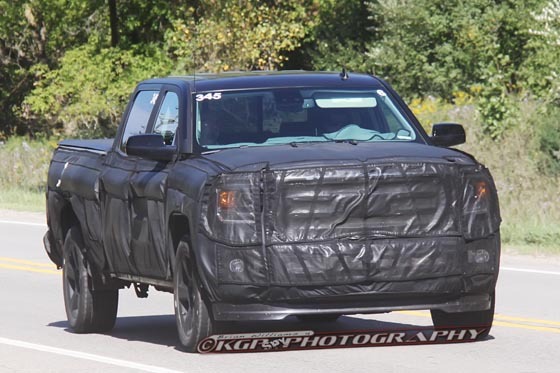 According to our shooter regarding the Sierra 1500, this could be the Denali model, with what looked like retractable running boards fitted into the lower sill. The Sierra 3500 HD dualie prototype, cleverly made to look like its Chevy partner, is an imposing beast, with a larger, beefier front fascia. That could mean there are some Duramax improvements to come that require more air-flow for cooling purposes. Likewise, it looks like they’re keeping the same DEF tank location as on existing turbodiesel models as well.